Poppy and her panda bear friend Sam hear crying in their garden. Someone has taken a bite of one of Basil’s leaves! Poppy and Sam are on the case. They ask different insects where they were that night, they hideout to watch the next night, a honeybee helps make a sticky honey barrier around Basil so the thief is caught, but nothing works. Finally, Poppy comes up with an ingenious solution. Basil helps teach the thief that everything tastes better when offered freely rather than being taken. 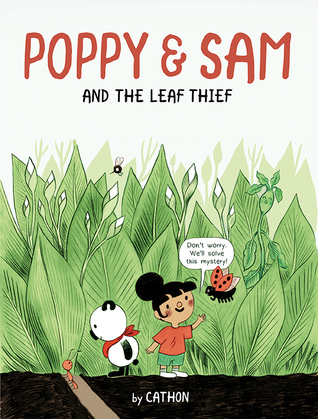 Poppy and Sam and the Leaf Thief is composed in a comic-book style that kids will really like. Its illustrations are great and the garden makes for an interesting setting filled with talking plants and insects. If you’re interested in reading Poppy and Sam and the Leaf Thief, you can purchase a copy here on Amazon.